Look for the “FLYING PIG” sign next to Medford Food Mart at 216 N. State Street, Jerseyville, IL. so come in and see us! I love that there are different options everyday! Not just good sandwiches but good Tacos, Soups and Burgers! I could come here everyday and never get tired of it. We love the food. 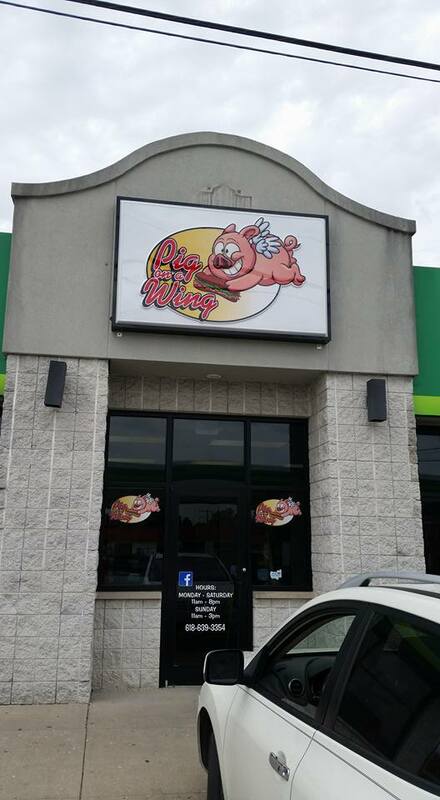 Anytime we ask our kids where they wanna go eat in Jerseyville Pig on a Wing is their first choice! Best sandwich place! We love the ribeye sandwich with the horseradish sauce. Also only place to get Zapps chips! Pulled pork nachos and the beer cheese soup are awesome! I have yet to have anything disappointing from POW! Keep up the good work y'all! They have the BEST sandwiches around! Always fresh food. And their staff is very accommodating with special requests! Love this place! Love Pig on Wing! Sandwiches are always delicious especially the Ribeye with POW sauce!! Staff are friendly & great! Favorite lunch spot for my husband & I! Pig on a wing has the best sandwiches in town! Always fresh food and friendly service! Pig On A Wing is the best. One of our families favorite. Love Steve and Megan great place. Absolutely the best Sandwiches around. You always get more that enough & I LOVE the drive-up window. Very good food! I love coming here to eat and the staff is always friendly! Great food! Love the buffalo pig! Glad we have this establishment in Jerseyville to enjoy. Everytime I go, I try something new, and I’m never disappointed. I love having a sandwich shop where I can get some delicious pastrami on rye; it’s hard to find these days! So goooood: 10/10 would recommend! Great place with great food and kind people who run it. I hope you have many more years of success. Delicious! Each sandwich is filled to the brim, definitely get your moneys worth. My favorite...grilled cheese pulled pork with slaw. Yum! Always great food no matter what you try and always great service! I get sandwiches here at least once a week and have never been dissatisfied. I have tried almost all of them and loved them all. I have to be careful who I tell I'm getting them for supper or I will be bringing sandwiches to the whole town!!! Update, tried the G.W. last night, it's just as awesome as all the rest!! I have been here twice now and they Have he best sandwiches around hands down! Always great food, call ahead and it’s ready, drive thru convenience, makes large orders easy. I've been here on three different occasions, each time I got something different and every time it was amazing!! My husband always gets something different from me and his is always great also! The buffalo chicken sandwich is to die for! Will definitely be coming back! It is definitely the best sandwich place in Jerseyville. Each tray has about 40 mini sandwiches consisting of Turkey, Ham & Cheese, Pig on a Wing, and The Italian. Feeds approx 10 people. Advance notice is recommened. A large pan of your choice of Garden, Greek, or Chef's salad. Iceberg lettuce, ham, hard boiled egg, and our blend of cheeses, served with your choice of dressing. Romaine, red onion, pepperoncini, kalamata olives, and feta cheese, served with your choice of dressing. Romaine, iceberg, red onion, tomatoes, cucumbers and our blend of cheeses, served with your choice of dressing. Turkey breast, your choice of cheese, tomato, lettuce, red onion, and our buttermilk ranch dressing, served on a baguette. Cucumber, tomato, mixed greens, red onion, pepperoncini, roasted red peppers, provolone, and our roasted garlic mayo, served on wheat bread. Turkey breast, H & B bacon, provolone cheese, lettuce, tomato, red onion, roasted garlic mayo, served on a baguette. Turkey, H & B ham, H & B bacon, lettuce, tomato, red onion, cheddar and swiss cheese with POW sauce, served on a baguette. Braised beef, cooked slow and low in the classic Italian way with our blend our Italian spices. Topped with a Giardiniera pepper medley. Served wet on a baguette. Volpi Genoa salami, cappicola, mortadella, pepperoni, lettuce, tomato, red onion, pepperoncini, roasted res peppers, provolone cheese, and our creamy garlic Italian, served on a toasted baguette. Toasted wheat bread, provolone, cheddar, and American cheese with H & B bacon. H & B ham, cheddar cheese, and spicy mustard served on your choice of bread. Turkey, H & B ham, H & B bacon, provolone, American cheese, buffalo sauce, buttermilk ranch on toasted sourdough. Grilled mortadella (Italian bologna) with American, Provel, and spicy mayo on toasted sourdough. Just a big pile of pastrami with swiss cheese and spicy mustard. Grilled and served on rye bread. House marinated chicken breast, H & B bacon, lettuce, tomato, red onion, Swiss cheese, and roasted garlic mayo, served on a wheat bun. Hansen's smoked Italian sausage, grilled onions, provolone cheese, and our mustard mayo on a toasted baguette. Corned beef with kraut, 1000 Island dressing, and Swiss cheese. Grilled and served on rye bread. Just like the Reuben, but made with pastrami. A ribeye straight from Hansen's, grilled red onions, smokey horseradish sauce, pepper jack cheese, on a toasted baguette.